Oh wow, I better not pout, because I now have the ultimate set of Chubby Stick lip color. The ultimate set of Chubby Stick™ lip colour minis $49.50+ for a $116.50 value. Set 20-pc layerable minis let you mix and match to create your own one-of-a-kind lip color. Confession time. This is my first Clinique purchase. I don't really need another lipstick, let alone 20 of them. But my, it's too good not to buy. Honestly, I didn't even know how much savings I'm getting. I just thought, $49.50 for twenty shades, what's not to love?! So I swatched. Clinique Chubby Stick™ lip colour swatches. Sorry, not much of browns and nudes so I didn't try them out. I've heard so much ravings about the Chubby Stick. But at first look and try, I like that they're so easy to apply. No frills. Plus, this time of the year, my lips can use extra moisturizing. 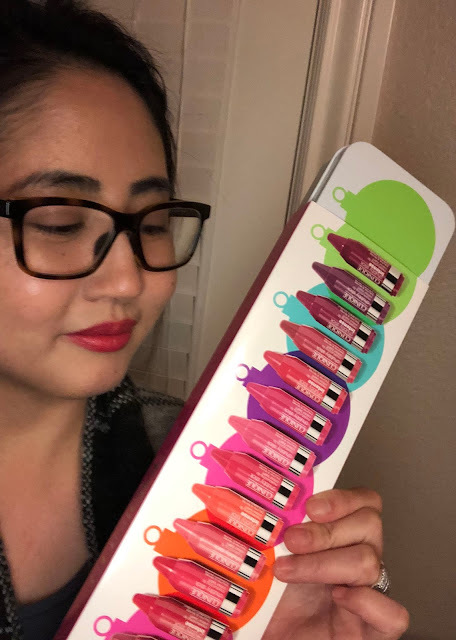 The layering and mixing-and-matching also got me, just how I like to own my scent , a one-of-a-kind ChicSassyMom's lip colour sounds appealing. So yes, let's do this! Oh by the way, I got these in Macy's, but just in case, shopping online at Macy's sounds also a good idea as there's gift with purchase offers, more freebies. Yay!